Ferdinand Magellan is remembered in the west as the intrepid Portuguese explorer who led the first voyage to circumnavigate the globe, but for the Philippines he is just another white man who fell to his death attempting to conquer lands that did not belong to him. The real hero—for the Filipinos—is Lapu-Lapu, the tribal chief who famously vanquished Magellan becoming the first Filipino hero to successfully resist colonization by a foreign power. Magellan’s conflict with the proud and unyielding chief resulted in his death, which cut short Magellan’s goals of becoming the first person in the world to circumnavigate the world. Ferdinand Magellan set sail from Spain in 1519 leading a Spanish armada of five vessels. He headed south through the Atlantic Ocean to Patagonia, passing through a strait that now bears his name and into a body of water he named the “peaceful sea”, from which came the modern name “Pacific Ocean”. On 16 March 1521, Magellan sighted the islands of Philippines becoming the first European to reach the archipelago. Magellan had two agendas—1) search for a westward route to the Maluku Islands, also known as Spice Islands, near Indonesia, and 2) claim any islands he could find for the Spanish crown before the Portuguese could make their move, and be rewarded by the Spanish king. This was despite the fact that Magellan himself was Portuguese. Magellan’s questionable loyalty towards his own country stems from his inability to convince the King of Portugal to fund his expedition, forcing him to turn to Spain. Magellan landed on the island of Homonhon and befriended the chieftains of Limasawa. They then introduced Magellan to Rajah Humabon, the Rajah of Cebu, who was promptly baptized into Catholicism along with his wife and his subjects. Humabon acquired the Christian name Carlos, in honor of King Charles of Spain. His wife took the name Juana, in honor of King Charles' mother. Apparently, Humabon so enjoyed the renaming process that he went around Cebu Island giving each of his people new names. 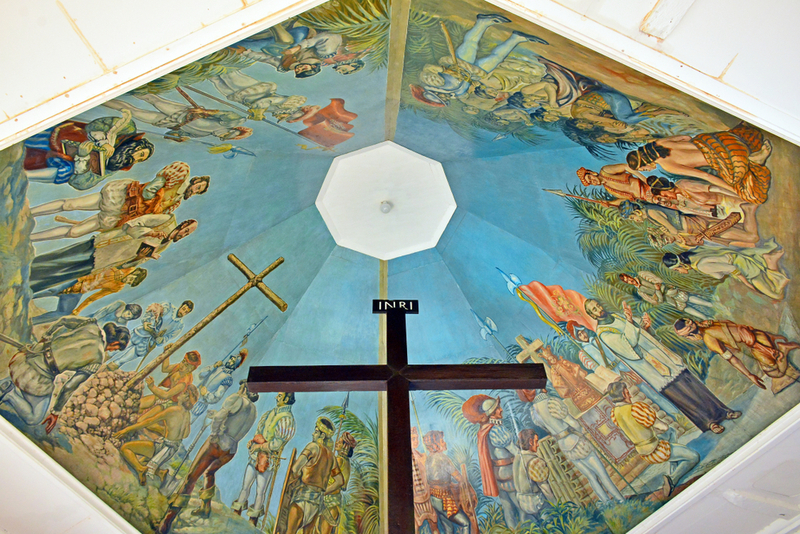 Eventually, many nearby chiefs agreed to convert to Christianity—all except one: Lapu-Lapu, who refused to accept the authority of Rajah Humabon and bow down to the King of Spain. 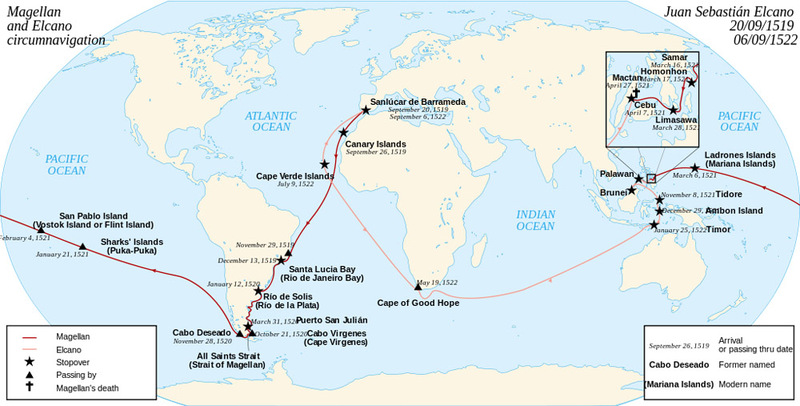 Map of the first world circumnavigation of Ferdinand de Magellan and Juan Sebastián Elcano, from 1519 to 1522. Rajah Humabon convinced Magellan to go to war against his rival, Lapu Lapu. Lapu-Lapu, who ruled Mactan Island just across the waters from Cebu, had become a threat to Humabon. Humabon figured if he could get Magellan to defeat Lapu Lapu, he could rule over both Cebu as well as Mactan Island. But Magellan was too arrogant to see Humabon’s true motives. On the contrary, he tried to impress Humabon by instructing the chief not to intervene in the imminent battle. 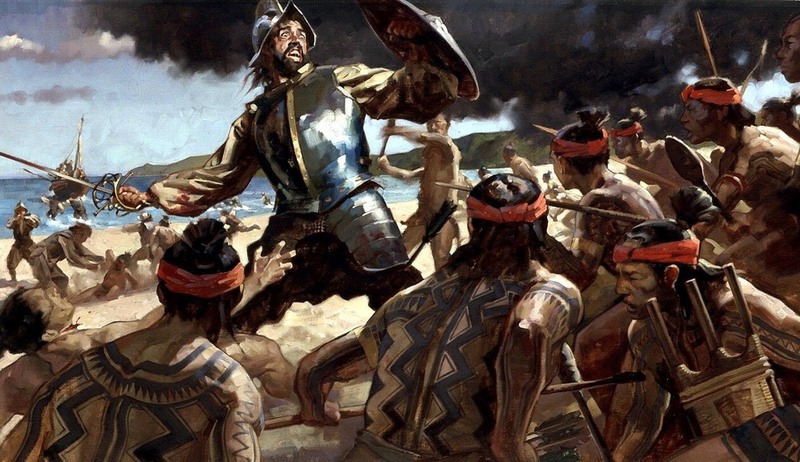 Magellan believed that he could win the battle unassisted because of his superior weapons—guns and crossbows, against primitive spears and bows the tribal army used. This was despite the fact that Magellan was staggeringly outnumbered—only forty nine men against fifteen hundred, if contemporary account is to be believed. Humabon saw this as an opportunity, and decided to watch the battle from a distance. Perhaps he too believed in the might power of European weapons. Humabon figured that if he took part in the battle and lost, Lapu-Lapu will emerge as the strongest in Cebu, and the rulers will soon shift their support. However, if Magellan alone lost, Humabon can save face and say that he was only a spectator to the event. The battle that followed was unsurprisingly one-sided. 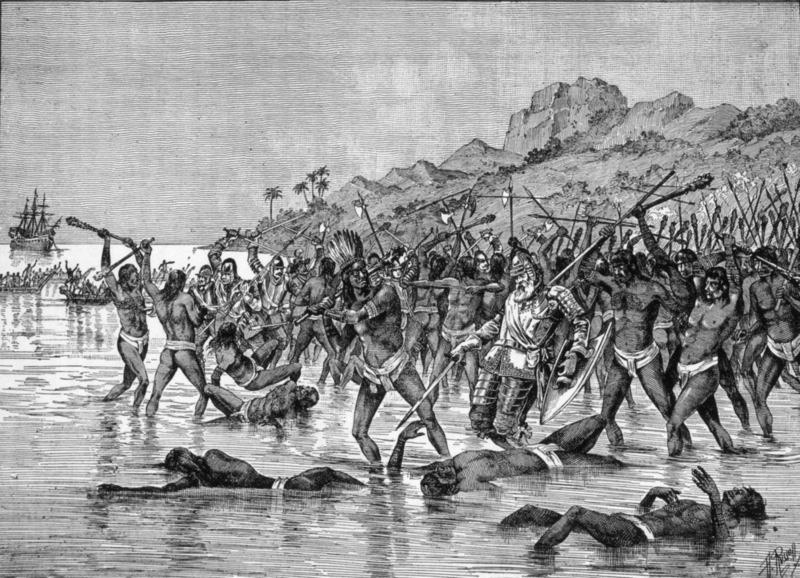 Lapu-Lapu’s men managed to stay beyond the range of Magellan’s guns and crossbows while showering them with arrows. Firearms were a relatively recent development and loading them took from ten seconds up to a full minute. During this time, the Spanish remained vulnerable as the beach offered little cover. Outnumbered and encumbered by their armor, Magellan's forces were quickly overwhelmed. Many of the warriors specifically attacked Magellan. Recognizing the captain, so many turned upon him that they knocked his helmet off his head twice... an Indian hurled a bamboo spear into the captain's face, but the latter immediately killed him with his lance, which he left in the Indian's body. Then, trying to lay hand on sword, he could draw it out but halfway, because he had been wounded in the arm with a bamboo spear. When the natives saw that, they all rushed themselves upon him. One of them wounded him on the left leg with a large cutlass, which resembles a scimitar, only being larger. That caused the captain to fall face downward, when immediately they rushed upon him with iron and bamboo spears and with their cutlasses, until they killed our mirror, our light, our comfort, and our true guide. When they wounded him, he turned back many times to see whether we were all in the boats. Thereupon, beholding him dead, we, wounded, retreated, as best we could, to the boats, which were already pulling off..
After the death of Magellan, the surviving sailors, under the command of Gonzalo Gómez de Espinoza, resumed their expedition on two ships, abandoning the third because of lack of adequate hands. Disease and shipwreck disrupted Espinoza's voyage and most of the crew died. One of the ships was captured by the Portuguese while the other managed to continue on her journey completing the circumnavigation under the command of Juan Sebastián Elcano. Meanwhile, Lapu-Lapu and Humabon restored friendly relations; Humabon even helped Lapu-Lapu kill several of Magellan’s men by poisoning their food. Lapu-Lapu later returned to his native land Borneo, and nothing more was heard of him. Today, Lapu-Lapu is retroactively honored as the first “Philippine national hero” to resist foreign rule, even though the territory of Philippines did not exist at the time. 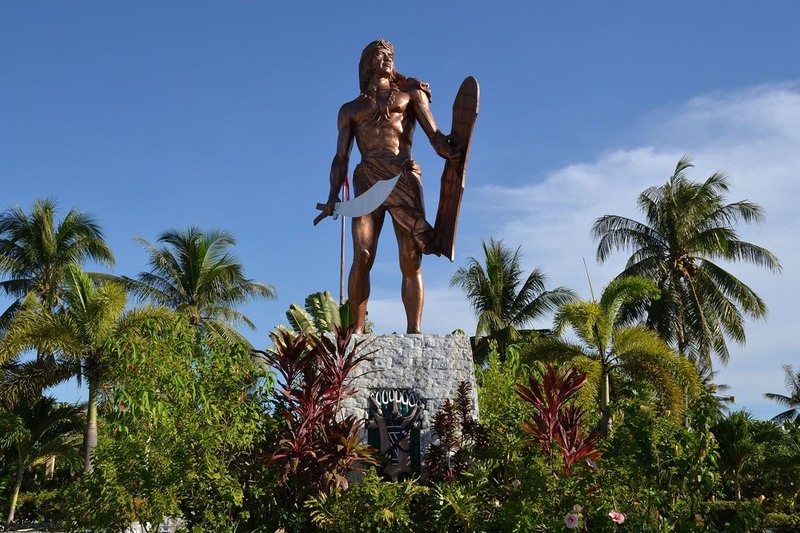 There is a tall, shimmering bronze statue of the tribal chief wielding a sword in one hand and a shield in the other in the center of Mactan Island, and numerous commemorative statues through Philippines. At the Cebu Provincial Capitol, a city bears his name, and a local variety of red grouper fish. Lapu-Lapu also appears on the official seal of the Philippine National Police. Every year in April, the Battle of Mactan between Magellan’s army and Lapu-Lapu’s tribe is reenacted during its anniversary.